Enhance your outdoor or indoor environment with the brand new Hyperikon® high lumen street lamp. Hyperikon has strived to engineer an energy-efficient yet simple and beautiful light - the result is the street light series providing a wide range of both wattages and colors. The street lights are available with both large screw base (E39) as well as medium screw base (E26). The lights can replace any 400W-700W high intensity discharge (HDS) or low pressure sodium (LPS) luminaires. With 50,000+ rated hours of lifetime, the bulb will last 23 years with 4 hours of usage per day. Commercial and industrial grade - constructed with heavy-duty corrosion resistance die-cast. Please note that the existing ballast must be disconnected or bypassed prior to installing our 80W and 125W LED street light. ✔ SAVE 89% INSTANTLY - Cut down your electricity bill by up to 89% by replacing 700W with 80W! ✔ REBATE ELIGIBLE - Holds DLC certification for best potential rebate from your local energy provider. UL-classified [E472253] to avoid electrical shock and fire hazard. ✔ TURNS ON INSTANTLY - Our Street Light is engineered to light instantly when the switch is flipped. No more waiting for bulbs to "warm up" or turn all the way on! 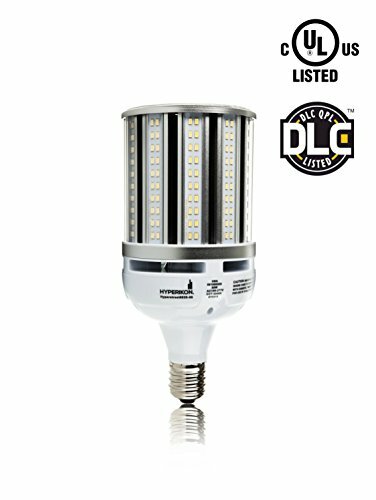 ✔ EXTRA BRIGHT - Incredible output of 10,400 lumen at a stunning 130 lm/watt ensures maximum light output with minimal energy use.